Great snapshot, dear Captain. The photograph is nice. Well done and very pretty. Congratulations, Captain Cook. Fantastic! What I like about this are the people surrounding the sleeping man. Their relaxed body language makes them seem to be so familiar or impervious to this type of scene that the homeless person becomes less human...not even an object of their curiousity or compassion. 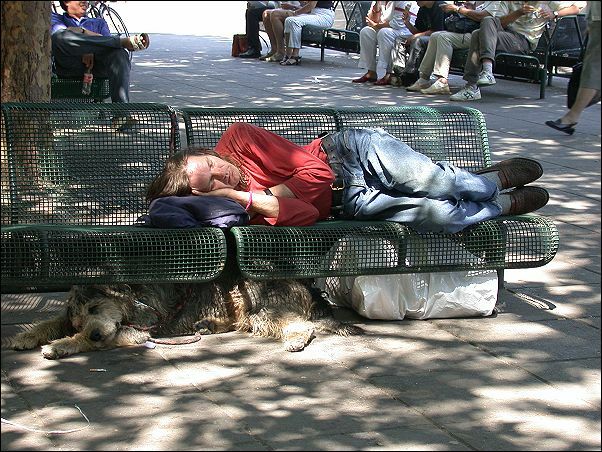 But the dog sleeping under the bench...he/she gives this unknown person another dimension other than being homeless. One, that despite his unfortunate circumstances, is still capable of caring...perhaps quite a bit more than the other people in this shot. Many many thanx to all of you for your comments!